We went to grandma's house a couple of weekends ago and the kids had a great time. 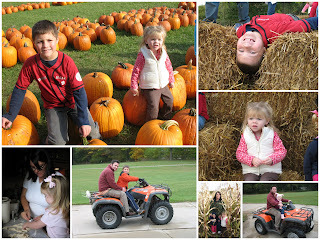 We were able to go to a pumpkin place that had a corn maze, pony rides, feeding animals (deer, goats & turkeys) and mining for gold not to mention the pumpkins, gourds and mums that you could buy. 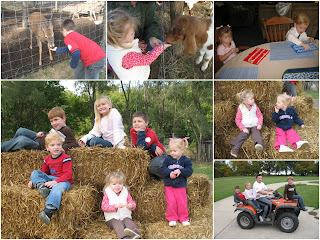 The kid had lots of fun as they ran around playing with their cousins and feeding the animals. Uncle Adam gave the kids rides on the four-wheeler and Olivia made biscuits with grandma. The whole weekend was great and we are looking forward to Thanksgiving! i was there too a couple of weekends ago! Always a fun time, never a long enough visit! I love that picture of Preslie and Olivia!